The Detroit Tigers will be relying on their Minor League System more in 2014 than in the previous few years. Players have been traded or lost to Free Agency, carving a path and opportunity for some. Nick Castellanos has the grandest shot at making some headway at the 3B position, and Jose Iglesias will see a full year at SS in Motown. When you factor in Ian Kinsler at 2B – and Miguel Cabrera at 1B, then none of the 2014 opening days Infield positions will look the same. Dave Dombrowski has done an exceptional job at replacing some of the Minor League levels. This was a big reason why they traded Doug Fister. Robbie Ray is their best Starting Pitcher not to start the year in Detroit. He may even get the call at some point this campaign. Justin Verlander is one of about 10 True Pitching Aces in the game right now that are starters. Verlander can throw 100 MPH at any time in the game, plus seems to ramp it up as the game progresses. The 30 Year Old just signed a massive contract extension that runs through 2019. His 7 YR Deal is worth $180 MIL, and there is a Vesting Option for 2020. 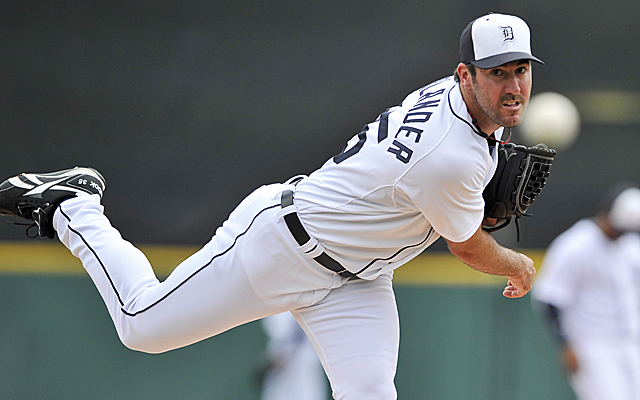 JV is having his toughest season a pro – with a 10 – 8 record – and a 3.99 ERA in 2013 so far. He is still 134 – 73 (.647) for his career – with a 3.45 ERA. He has a CY Young (2011), and 4 other top 7 CY Young Voting Finishes. With Scherzer and he anchoring the staff, along with Fielder and Cabrera manning the offense they should dominate the AL Central for a few more years to come. You guys are all in for a treat. Jeff Kleiner recently contacted me about a partnership merge for the website. He has developed a site (prosportsrosters.com) that covers all organizational affiliates in the Minors for all of the Major League Baseball Clubs. We are going to combine efforts to bring you the best look at salaries, current 25 Man Player Rosters and Depth Charts for all 30 teams. Jeff is going to provide the documents in form of spreadsheets and I am going to accompany the posts with deep analysis of what the numbers tell us from my perspective. If you can’t wait for all of my assessments for each club, go and visit Jeff’s website over at http://www.prosportsrosters.com. In Speaking with Jeff, he is one of the more passionate fans I have come across towards the game of baseball. He spends enough time in updating his MLB Facts for it to be a Full-Time Job. So after the usual Video Clip and READ THE REST OF THIS ENTRY button, you will find some serious &*!@?!#! For a Full 3 year Salary Outlook plus last years Stats for every player in the Tigers Organization click here.